We still had cabbage and celery left so for lunch, we took an old mushroom asparagus risotto recipe and swapped out the mushroom and asparagus for cabbage and celery. We have been using the recipe for so long that I don't remember where we got it. We bought a house years ago and it came with an asparagus plot so we learned to do it as a way to use all that asparagus. As for the cabbage and celery risotto, it did not go at all well. The cabbage and celery are not even visible since they became translucent with cooking. It was a pretty tasteless mess. It was excessively chewy from all the cabbage with no flavor to back it up. I would consider this one to be the only real failure of this week. 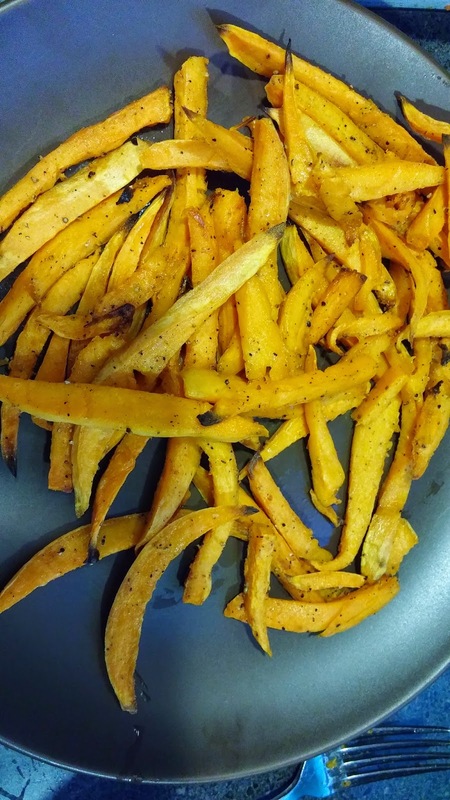 For dinner, we used the last sweet potato to make sweet potato fries. Here is that recipe. This went very well. We sliced them on the thin side so they looked like fries. They had a sweet taste to them so they definitely are not like regular fries but tasty. We would do this one again. Here is the picture of that. Husband sautéed up the last onion in some olive oil for a side as well. I took that one lemon and made lemonade. We used both the fries and onions as sides and pan fried some veal I had defrosted as the main entrée. We now only have one grapefruit and some celery left so I doubt we will do anymore experimenting this week. Two days until our next farm box and it will supposedly contain "Dino Kale-Rainbow Chard-Red Cabbage-Yukon Gold Potatoes-Celery-Onions-Tangelos-Beets-Broccoli-Grapefruit+Lemon". We will see what we get.